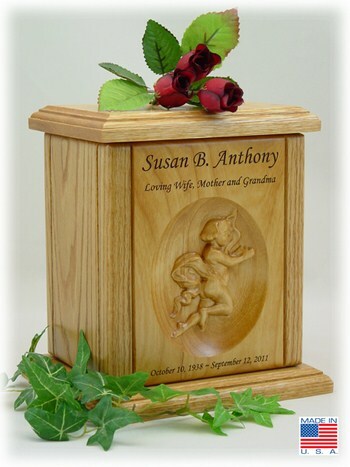 The Cherub Relief Carved Wood Cremation Urn is made of solid red oak and red alder with a clear finish that brings out the natural beauty of the wood. The cherub angel is relief carved into the wood making the image three-dimensional. The urn can be personalized with the name, dates, and a loving remark such as Loving Mother and Wife.